There was a bit of a kerfuffle last week over a statement made by Mitt Romney's campaign suggesting that President Obama's economic policies have not been good for women. Specifically, the campaign made the completely accurate statement that women make up 98% of the jobs lost since the President took office. 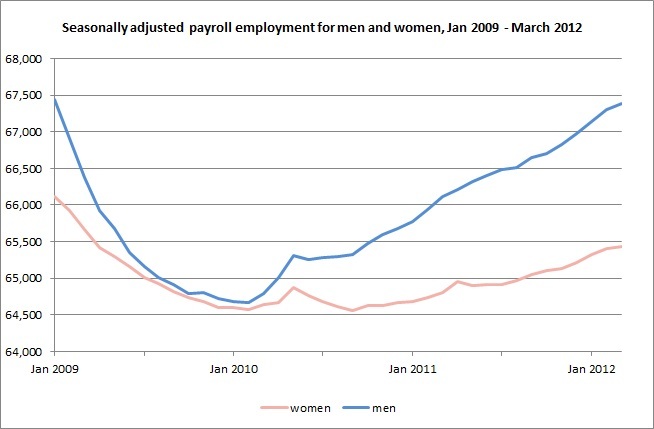 As of March 2012, women's employment was 683 thousand lower than when the President took office in January 2009, whereas men's employment was only 57 thousand below its level then. Two prominent "fact-checkers" cried foul. Glenn Kessler of the Washington Post declared the claim to be "True but false" and PolitiFact called it "Mostly false" despite noting that it is, in fact, true. Both of these fact-checkers made the mistake of mixing fact-checking with analysis and, as a result, have certainly given the impression that they are willing to bending over backwards to protect the President. In their minds, despite the fact that the claim was absolutely true, it was false because they deemed its implications to be unfair to the president and his policies. 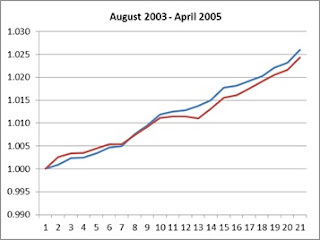 They argue correctly that the drop in employment through 2009 was not due to the policies of the Obama administration, but that has nothing to do with the factual accuracy of the original statement. What they should have said is that the claim was true but not entirely fair in its implications. Then they could have gone on to explain why they thought it was unfair. The degree to which the claim is unfair is debatable, but to them it was not, so it must be labeled as false. Semantics aside, by focusing on whether or not the job losses during the tail end of the recession can be attributed to President Obama, the fact-checkers completely miss the point. 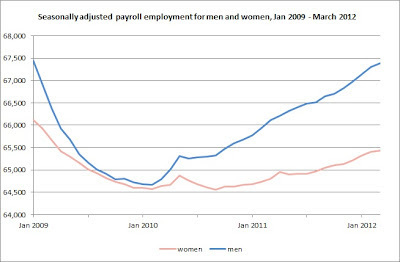 As the chart above shows, the reason that the gap between men and women is so large is because of what has happened during the recovery, which is entirely President Obama's. It is not normal for women's job growth to lag so far behind during recoveries. In fact, since 1970, women's job growth during recoveries has tended to be higher than for men. The charts below show what happened in the two or so years following the previous three recessions. Each line shows the level of employment relative to the month when payroll employment bottomed out (i.e., since the start of the employment recovery). 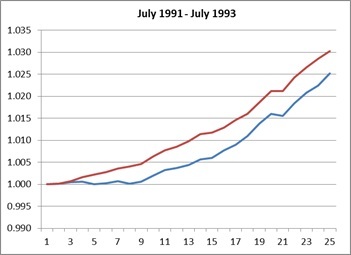 The red line is for women and the blue line is for men. 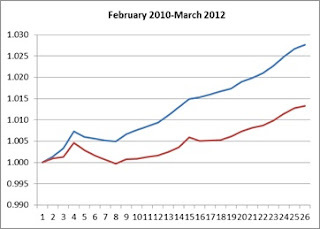 As is obvious, what has been going on for the past two years of the Obama recovery is far from the normal pattern. Perhaps one can claim that the reasons that the Obama recovery has been terrible for women relative to men have nothing to to with the president's policies. But one cannot claim that what has been happening is normal.